“I heard you are creative. How do you open a wine bottle without a corkscrew?” I asked. “With a pen and a boot, but it’s not easy,” she assured. Mo was her name and since my middle name is Jo, we became MoJo, what I would like to call our combined personal brand for the evening. It was cold. Go down the alley and make a left at the garbage can, and then you see the building. It’s big. It feels like the meeting location for SheSays Chicago, a local chapter for professional women in marketing and creative fields. You are further reassured by the group of fashionable women surrounding the call box. Follow the posse wearing variations of black riding boots to the second floor. 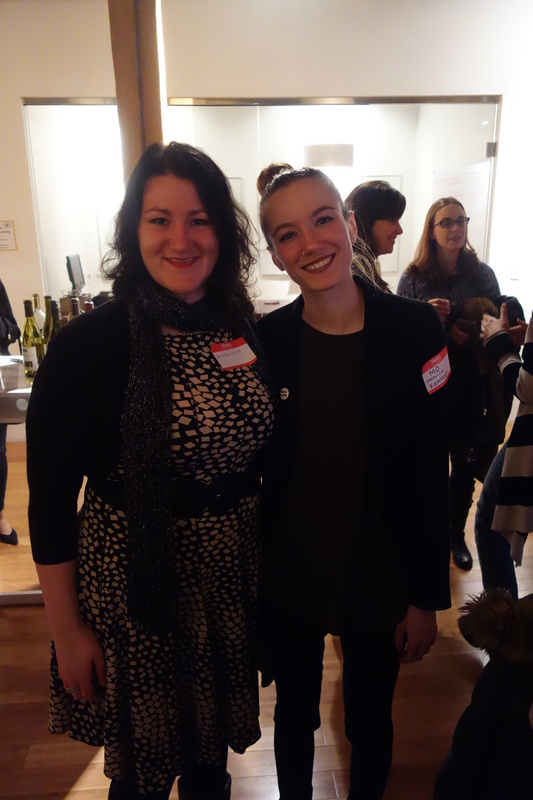 Amanda Elliott and Monica Komperda at SheSays Chicago’s networking event. We signed in and picked up our yellow worksheets, which included three boxes: three things I want to be known for, tools to remember, and additional notes. After a solid hour of networking, the cacophony subsided and you could finally hear the song “Looking for Trouble” in the background. We gathered our attention to curator, Jen Lemerand(@shesayschicago) and the panelists. This evening we were discussing personal branding. As always, the panelists were all successful and happy professionals, who offered insightful tips and stories from their own success and failures. The panelists included: Founder and CEO of SOCIALDEVIANT, Marc Landsberg (@marclandsberg), Creative Owner of Appleavocado and Digital Art Director at SOCIALDEVIANT, Elisha-Rio Apilado (@erioapilado), Assistant Vice President at The Creative Group, Angela Vitzthum (@AngelaVitzthum), and Writer and Blogger, Nikki Carpenter (@Nikkiandthecity). Below mirrors the Q&A flow from the event. “What are you better at than anyone else in the world?” Answer this question, and Marc calls this “the gooey center of your personal brand”. The recruiter in the room, Angela, assured that if you are culturally a better fit, “than you’re gonna be a better hire”. Nikki, another panelist, emphasized the importance of personal branding. She was unhappy with her job and would focus her energy on her blog. When potential clients asked her, “Who do I write for?”, she replied “I said, ‘I write for myself’.” She built a business from her personal brand. Her portfolio includes bylines in Huffington Post, ESSENCE, and JET. What defines what you’re good at—your super power? Finding the right context for your super power is just as important as naming your super power. Other panelists, like Angela noticed that she was always on time, but also noticed that she’s not good with directions. To clarify, how do you get to that “aha” moment? Marc, for instance was always leading clubs in high school and college. His resume showed that he was a leader. Saade Taylor, Photographer and Designer, and friend, Anthony Johnson attendees at SheSays Chicago. An audience member, Kelly Simos, shared that she was miserable at work. She followed her passion and now has her own photography company, Kelly Simos Photography. Your effort is not overlooked when you have done your research, found the right context and recipient, and apply the message repeatedly. The general consensus is that effort goes a long way. An audience member, Anuli Akanegbu(@akaanuli_tweets) from Edelman, suggested composing a list of attributes, which are value-based. Everything that Anuli spends her time on has to align with the list. She consults it periodically to note her values. Marc offered, “The world is full of generalists,” noting that most CEOs come from a background in specialization like accounting. Panelist and recruiter, Angela, grounded the conversation and our thoughts, ” I would love to make six figures and work from home two days a week,” she said, but noted that we have to be realistic with our expectations of work. “The grass is never greener on the other side. It’s just a different shade of green,” Marc added. 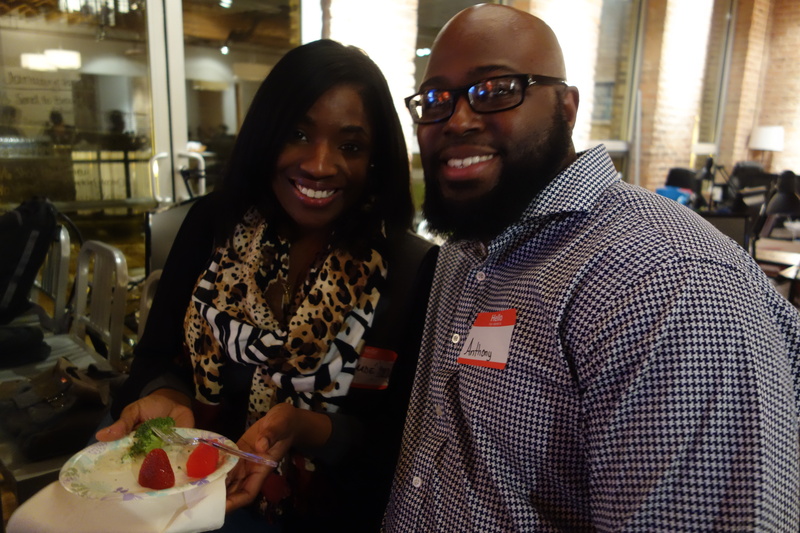 Audience members and panelists spoke about how they used their name to draw attention and build their brand. Audience member, Anuli suggested that when thinking of your brand, you need to “manage other people’s expectations of your brand”. She has a website, akaanuli. Panelist, Elisha-Rio, just launched a personal website, Don’t Forget the Hyphen, because her father stressed that all of her documents like her diploma had to include the hyphen in her name. She originally had a website about “apple avocado,” which is what someone suggest she said to people to help them pronounce her last name correctly. The name stuck and family members share an “apple avocado” tattoo. While creating a brand is the first step, constant execution and goal setting is key. SheSays Chicago’s organizer, Jen suggested that we start a small subgroup to hold ourselves accountable to starting and working on our personal brands.